Chris Simayi arrived at SACS High School in 2013. He was at SACS Junior before moving a small distance up the hill. He played rugby for Mr Casey Morgan’s mighty U14C team. It was here that he developed an interest in refereeing. Chris watched the 1stXV games and seeing those refs in front of those large crowds inspired him to pursue his interest. He only completed the WP Referees Course in March 2016. He was assisted with the financial requirements and sat the two day course under the watchful eye of Mr Ben Theron (WP Rugby Referees Manager) at the DHL Newlands Stadium. Armed with his referees qualification, he was ready to take to the whistle. 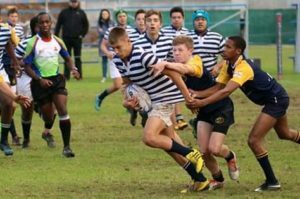 SACS Junior afforded him the chance to ref his first game in April 2016. It was an U10C game between SACS and Durbanville Primary. He continued, always eager to learn and take advice, refereeing at SACS Junior for the remainder of the season. 2017 proved to be a good year for Chris as he was introduced to a few tournaments by his close friend David Paterson (son of one of the most capped provincial players of all time, Andrew Paterson). Chris managed to make his way into a group of young referees. Ben Theron took notice of this up-and-coming referee who was so eager to learn. He now was entering the big games. He was being involved at the Cape Schools Festival at Rondebosch, the Wynberg Festival and the Newlands Rugby Day as assistant referee. Chris also reffed at Brackenfell High Land Rover Junior Sports Festival, Curro National 7s and reffed at the WP U15 trials at City Park. Mr Graeme Wepener thought he was now ready to ref games at SACS High School with all this experience. Chris Simayi was awarded the WP Rugby Referee Junior Ambassador of the Year Award at a prestigious ceremony at the end of 2017. 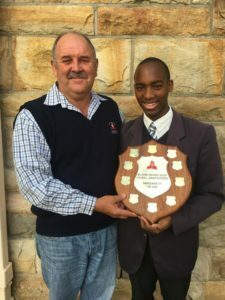 He was the also presented the award in front of his school with Mr Ben Theron as the guest speaker. In 2018, Chris continued to improve. He reffed at the West Coast Rugby Festival and the Paarl Gim U14 Tournament. His big break deservedly came when he was selected as one of 4 referees to ref at the Vision Sports 7s in Mauritius. Another big moment for Chris was being the ref for the SACS vs Wynberg Derby Day, taking charge of the U13A curtain raiser to teh 1stXV clash on the Memorial A. Chris was awarded the WP Junior Referee of the Year at his Validictory service in front of his fellow Matrics by Mr Ben Theron. Chris has been an inspiration to many and will continue to be a role model. He has grown into a wonderful young man. Always willing to assist and help in any way. Chris wanted the opportunity to thank the following people. All those who have helped me along my journey so far. In closing – I would like to say how much Chris has achieved. He made a conscious decision in 2015 to change his life and work hard to achieve his dreams. He has become larger than life in my eyes and I cannot thank him enough for what he has done, not only for SACS, but for all who have been inspired by him. Chris, I hope you go onto achieve so much more. I know you have been presented with an amazing opportunity to be an apprentice in a global company next year, whilst you continue your refereeing. I will follow you career with interest and I hope you continue to be involved with your alma mater. We salute you young man. What an awesome story of determination to succeed. Well done Chris and to all those who have supported him. None of these achievements can be done alone – it takes a village of supporters – but what Chris has shown is a willingness to work hard. And when the community sees this they will support people like Chris. Well done Barry van Selm well done SACS!